It takes a multidisciplinary team approach to manage an eosinophilic gastrointestinal disorder (EGID). Patients are often under the care of a primary care provider, a gastroenterologist, an allergist, a registered dietitian or nutritionist, and in some cases, a counselor or psychologist who can help provide strategies to cope with a chronic illness. 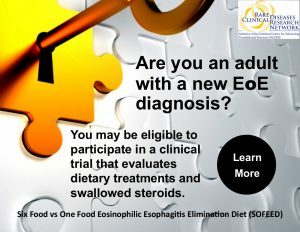 After a diagnosis of an EGID is made, you will likely have many questions, and may even be wondering what questions you should be asking. Here are some suggestions to note for your doctor’s visit. What is triggering the eosinophilic response? Do I have an underlying disorder/disease? Am I more likely to develop another disease as a result of my condition? Will I undergo allergy testing? What type of tests will be performed? What allergens will be tested? How long will I be on this medication? Would you demonstrate the correct usage of an inhaler so that I understand how to use it correctly? Could you provide a list of appropriate substitutions for foods that are taken out of the diet? Will I need to take vitamin supplements, and if so, what type? Will I need supplemental formula? Will I need to work with a dietitian or a nutritionist? How can I determine that I’m getting adequate nutrition? How will we determine if treatment is effective? How often will I need follow-up care? How often will I need to have a scope performed? How often will I need allergy testing? Special thanks to Kimberlee Walsh, PA-C, a board certified physician assistant and the mother of a son who has EoE, for her assistance in preparing this article.